The spleen functions to filter our blood through a unique system of open circulation. It monitors the blood for foreign antigens and is also involved in red blood cell quality control, since phagocytes in the spleen consume red blood cells as they try to escape into open circulation through arterial capillaries. 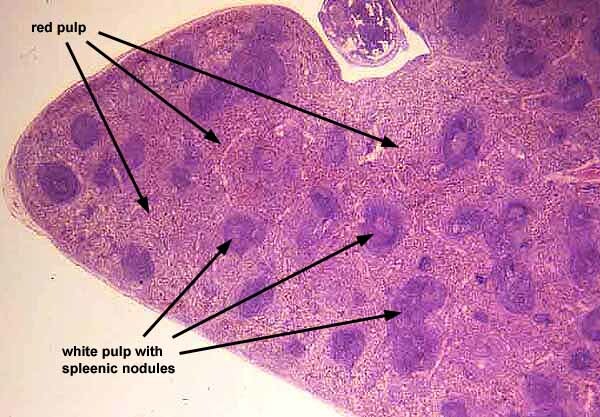 White pulp is lymphatic tissue that mainly consists of lymphocytes - B and T cells. Red pulp consists of venous sinuses (closed circulation) and splenic cords (open circulation). Histologically, red pulp appears purple and white pulp appears blue.